This page contains all the latest Marcos news, some is confirmed fact, other is rumour (I'll try and exclude stories with no basis in fact, but who knows!). Hopefully, this page will become a one-stop shop for catching up on the latest Marcos news and information. For older news, see the archive page. After 10 years, I've finally got my car, CLE 100H, back on the road!!!! Read how I did it, here. Gary Harman wrote to tell me about a new scale model Marcos. This one is available from the German Owners' Club, is of a Mantis convertible and made (it appears) of Carbon Fibre (I'm not 100% sure if it's real CF or not, but I suspect so). Price is €125 plus postage. Email me if you're interested and I will ask Gary for more information, or try the German Owners' Club directly. Reinhard Rieser has been in touch to say that the Swiss Owners' Club has been revived. The Club's new email address is : info@swissmarcos.club.ch. 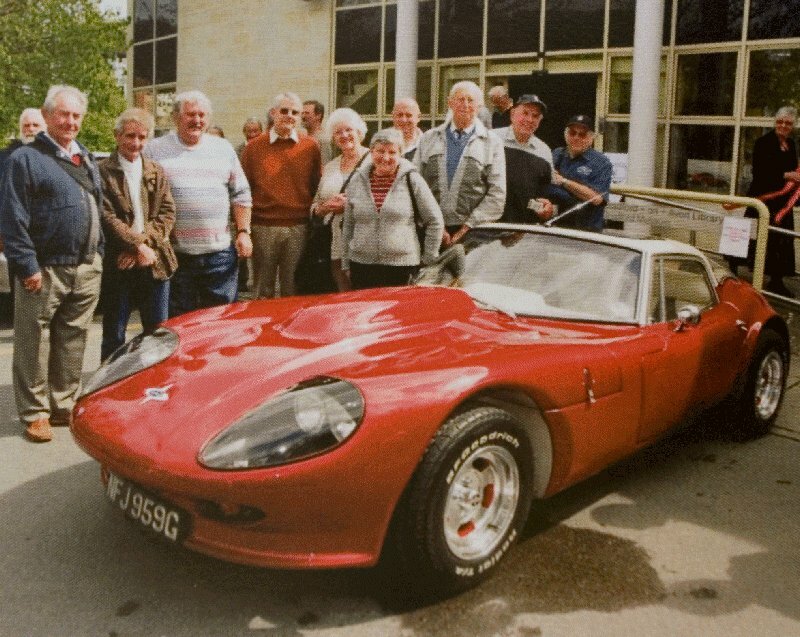 It was a while ago now, but Jem, Marcos owners and former workers at the factory celebrated the founder's 80th birthday at the Heynes Motor Museum and later at Bradford Upon Avon (once home to Marcos and still home to Jem and Lyn). I couldn't make the day, but thanks to all involved in organising the day (which I understand was a great success) and best wishes for many more birthdays to Jem. This image was on the FOS website. One of the undoubted show stoppers at this year’s Festival of Speed is the extraordinary Mantis XP. Conceived by Bradford-on-Avon constructor Marcos, and styled by Dennis Adams, this timber-hulled, mid-engined sports-racer was built in 1968 and raced only once in period. It was entered for that year’s Spa 1000km for Eddie Nelson and Grand Prix occasional, Robin Widows. When the latter decided to sit out the race, marque founder Jem Marsh took his place, although the former stuntman found contorting his 6ft 5in frame into the ultra-low cabin a bit of a chore. The car retired from the epically wet race early on its three-litre Repco F1 engine was subsequently removed and replaced with a Buick V8. The by now road legal machine was sold to an American enthusiast and 40 years later it remains in the same family ownership. Ned Morris has brought the Mantis XP over from his California home again to accept the invite to take part in the world famous Goodwood Festival of Speed event. The car is looking as great as it did at Prescott in 2010 and, although I was only there on the "Moving Motorshow" day on Thursday, I've seen photos of the car on the 'hill' (not really a hill, is it?) on Friday, so I expect it will be running every day this weekend. Ned commented that when he received the invite to take part he spoke to people who had not accept invites and regretted it, so hopefully he's having a great weekend - Thanks to the Morris family and Marcos Heritage Spares for bringing the car back to the UK. What next? The Le Mans Classic? The first of many (if all goes well) 2010 Thames Valley Marcos meets will be at the Bird in Hand, Knowl Hill (RG10 9UP) on Wednesday 3rd February 2010 from say 7.45pm. The event was very popular last year and he's keen to make it even better this year. I'm in the process of arranging some musical entertainment for the evening, which may or may not include some Marcos & Morgan members getting up for a number or two. We have a 3000 watt Turbosound PA and a wide array of Class A valve amps at our disposal to choose from if anyone is interested in participating. The theme is likely to focus on British rock bands covering the Marcos 50 years! (to keep the ACE regulars happy) We will be arranging some rehearsals in Croydon beforehand. The house band for the night should include the bass player from Eric Clapton's (early 1980's) touring band. I know there were earlier discussions via this email thread earlier on but I'm not sure if they were conclusive and I think Jack has included the range of options to choose from on the forum thread. Can you let me know if you have any preferences for this event? - music-wise or venue-wise- my mobile is 07951557466, best to call after 6pm weekdays or daylight hours weekends. Kiwi Marcos stalwart, Ray Green, wrote to tell me of the celebrations of the Marcos 50th Anniversary in New Zealand. No time to fill in the details as yet, as still recovering from organising the race meeting, Nov 28th/29th at the brand new Hampton Downs race track, just south of Auckland, NZ. A DVD of the event is to be produced with a specific feature on the Marcos cars, with 6 of the 12 races that were covered for television (will go out on Sky TV, NZ, probably January). Great racing too, with Alfa Trofeo Series, Open BMW, 2 grids of E30 BMWs, our own Arrow Wheels series and an exciting AES TradeZone race featuring my own Marcos Volvo 3 litre. Sorry guys, I didn't win the handicap races, but was carrying an in car camera in both. The racing was spectacular with a couple of major incidents caught on the external cameras (didn't involve me thankfully). Photograph copyright Groundsky photography, who will have a load more pics available later. 12th October 2009 : Cor Euser wins 2009 Dutch Supercar Challenge. Cor Euser scooped the 2009 Dutch Supercar Challenge, one of the foremost sportscar series in Europe (taking in rounds in Holland, Germany, the UK and Belgium). Up against Dodge Vipers, Ferrari F430s and Martin Short's Mosler, it's a great result for Cor Euser and extra special with the 50th anniversary of the marque still going on. 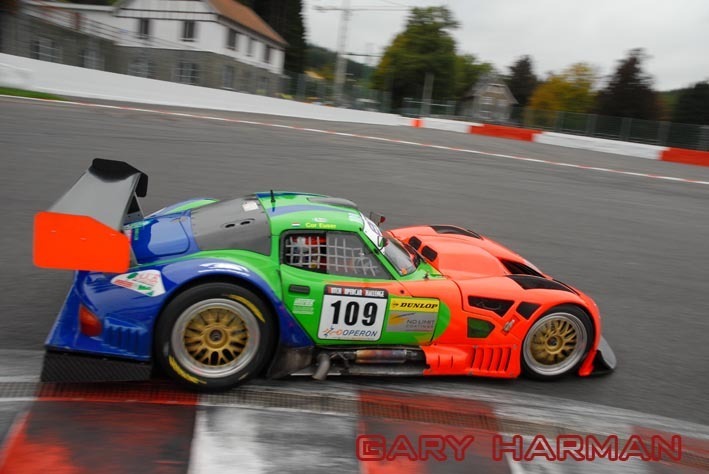 As you can see in these shots from Gary Harman, the LM600 proudly wore the 50th Anniversary stickers at Spa. As promised, I've now written up my impressions of the the 50th Anniversary event at Prescott on Sunday 16th August 2009. You can find the article, which features many new photos, here. More images from the 50th Anniversary Rally at Prescott Hillclimb can be found here for now. Images from the 50th Anniversary Rally at Prescott Hillclimb can be found here for now. Well over 200 cars were present including the only Probe 15, the XP racer, a Le Mans LM600, a Costin Amigo and many more Marcoses rare and not so. A fuller report and more pictures will follow soon. A huge thank you on behalf of all Marcos fans and owners to all involved in making it such a great event. Gary Harman let me know that you can now pre-order Jem Marsh's book on the Marcos Marque. As some of you are not aware Jem Marsh has a book coming out very soon! The on the RED > top right for more details. Due to its closeness to the Christmas dinner, the December TVG group meeting will probably not take place. Ray Green writes to let me know of plans to celebrate the Marcos marque's 50th anniversary in New Zealand. We have booked the brand new National race circuit at the Hampton Downs Motorsport Park, situated about 40kms south of Auckland, and half way between Auckland and Hamilton, alongside state highway one. Construction is on target for circuit completion June 1st 2009 – just after the local season normally finishes! This is a wonderful new facility, with 80 trackside, two bedroomed luxury apartments, of which, about 60 are available for rental as part of the Hampton Downs Motorsport Lodge. The booking is for a National race meeting, and will be for Saloons, Sports and GT cars, probably running the classes now deemed to be part of the local Classic scene. It is more than likely that the event will be televised and shown later on pay TV and possibly free to air, and a DVD may also be produced. 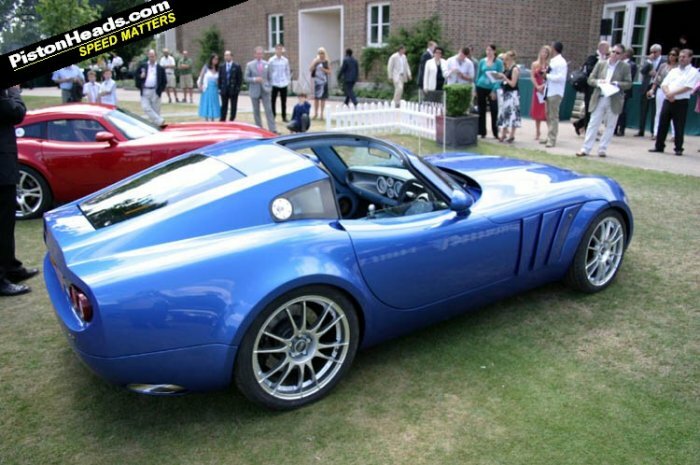 With the Marcos 50th anniversary in 2009 and already, strong support from local owners for some sort of celebration, this is also an opportunity for other fibreglass British sports and GT cars to be involved. Star car is likely to be the ex-Le Mans Marcos team LM500 and we will arrange a lunch time circuit parade by all supporting cars. Overseas owners are encouraged to support this event and head down under at a time when the Northern hemisphere weather is not too good. The circuit is also hosting a massive celebration of McLaren cars late January 2010, with many overseas cars already confirmed. Could be a great time to plan a retirement visit to NZ! Due to some blokes trying to blow up the Houses of Parliament (and sadly failing) hundreds of years ago, the TVG meet will be delayed one week until 12th November. I believe the location will be the Jekyll & Hyde, on the A33 north of Basingstoke. If you are in driving distance of the Old Bell, Grazeley Green (just off the M4 junction at Reading) on December 13th, you might be interested in joining the Marcos Thames Valley Group. Christian Fey sent over details of this year's Euregio - As usual it sounds like a great event. nach dem Le Mans Classic steht nun das Marcos Euregio Treffen wieder vor der Tür. Der ADAC als Veranstalter hat einige Dinge geändert. Der Name wurde von "Classic" in "Eifelrennen" geändert. Als Club sind wir wieder herzlich eingeladen und unverändert erhalten wir zum Vorzugspreis von 150 € Eintrittskarten für 2 Personen zu allen Rennen, Tribünen sowie Boxe, Club Parkplatz innerhalb des Paddock sowie die Teilnahme an 2 Gleichmäßigkeitsprüfungen auf der Nordschleife inclusive offizieller Zeitnahme, Startnummern etc. Back from the Le Mans Classic now the Marcos Euregio Meeting is coming. The organizing ADAC did change some things for 2008. The name is changed from "Classic" to "Eifelrennen" (in earlier days one of the big events on the Ring). The Marcos club will get a warm welcome as one of the first and regular clubs attending this event. Similar to the earlier events the ADAC offer a special Club package for 150 € the weekend including entry tickets for the team = 2 persons, the tickets allow you to visit all races, parking in the Paddock on a Marcos Club parking zone, free access to paddock, pits and all grandstands around the complete circuit and attendance for the 2 regularity runs on the Nordschleife with a total of 2 1/4 hours, official start numbers, official timer for every car are included. Helmets are obligatory for driver and co-driver !! no sound limits, no speed limits. Im Gegensatz zu Le Mans gibt es keine Geschwindigkeitsbegrenzung durch ein Pace Car sondern wie bisher kann jeder seine Geschwindigkeit selbst vorgeben, nicht der Schnellste ist der Beste sondern der die selbst vorgegebene Zeit am Besten in den folgenden Runden egalisieren kann. Hört sich einfach an, ist aber auf der Nordschleife schwieriger wie man meint. Gestartet wird Einzeln im 30 Sekunden Takt, sodaß auch der Verkehr auf der Strecke vom Start weg angenehm ist und man problemlos seine Linie fahren kann. Compared to the LMC "tour de piste" we have no pace car, so everybody can set his own speed and in the sense of a regularity run not the quickest will be the winner, but the team best equalizing their own presetting. At first view looks very easy, but you should not forget you drive on the Nordschleife and the length of each lap is nearly 21 km. Or you drive "just for fun" or as quick as you want. The start procedure is every 30 seconds a car, so even after the start procedure you donŽt have traffic and can find your rythm and drive your line. Das Hotel Nord in Rheinbach bietet uns wie in den vergangenen Jahren einen Sonderpreis, sowie eine bewachte Tiefgarage. Anfahrt mit Wohnmobil und Abstellen auf bewachtem Parkplatz, wie auch Zelten sind wie in den vergangenen Jahren möglich. The "Hotel Nord" Rheinbach offer a special rate (10% off) for the Marcos owners and offer a closed & guarded garage. As in former years no problem to come with a mobile home or tent, parking for trailer on a guarded parking area as well possible. Freitags Abends ist für die bereits anwesenden das "Rheinbacher Brauhaus" unser Treffpunkt. Samstag Abend wird in TomŽs Werkstatt ein gemütlicher Abend und "Benzingespräche" stattfinden. Friday evening we meet in the "Rheinbacher Brauhaus", Saturday evening in TomŽs workshop for a Barbecue in the Cafeteria of the GTC and some "fuel talks". Die Platzreservierung erfolgt mit Anmeldung und Zahlung des Nenngeldes (direkt an den ADAC). Anmeldeschluß: 20. August 2008. Ich möchte daran erinnern, daß in 2007 die maximal zulässige Zahl der Starter für die Nordschleife bereits vor Nennschluß erreicht war. Nachmeldungen wie in den früheren Jahren konnten nicht mehr berücksichtigt werden. Also schnell anmelden erscheint sinnvoll. To get the Reservation for your Marcos is only possible via the Entry list (= see the link) and the payment of the entry fee directly to the ADAC. Definite deadline is the 20. August 2008. I want to remain all of us, that in 2007 it was not possible to get tickets after the deadline as in earlier years, so the best is to book as soon as possible. Wir würden uns freuen, wieder möglichst viele Marcos anzutreffen und daher wäre es schön, wenn Ihr auch Bekannte und Freunde ansprecht. Aus organisatorischen Gründen wären wir für eine kurze Mail dankbar, wenn Ihr die Nennung abgegeben habt. We will be glad to see as many Marcos as possible and it would be very helpful to inform other Marcos owners & friends. For the organisation we ask you to send a short mail if you will join the event. Just spotted a link to a potentially very interesting website for Marcos fans. www.jemmarsh.co.uk is a website promising "some of my own personal archival photos and memorabilia" from Jem Marsh, the man behind Marcos. There's been talk of a new book for some time and Jem mentioned a while ago that in researching it a huge amount of material had come to light, so hopefully the site will start to fill up fairly quickly. I'll be watching it, for sure. Arrangements are starting to take shape for the weekend gathering, with Sunday booked at the Prescott Hill Climb circuit (north of Cheltenham), with the opportunity to take your car up the hill in a non competitive environment. Saturday will include the Concours judging, with other events to be confirmed. The aim is to get at least 150 cars in attendance for this once in a lifetime event, so plenty of time for you to get all those jobs finished. No personal information will be passed to any person or organisation by Marcos Heritage. I didn't even know this was happening, but Ned Morris has been busily having the unique Mantis XP racer restored. Dave McGill's site has the full story and an ongoing slide show of the rebuild process, but I'm sure he won't mind me posting one shot of the car, which shows the painstaking work going on to bring this incredible car back to its original glory (and then some, probably, given it was originally a race car built to perform rather than to the highest standards of finish. 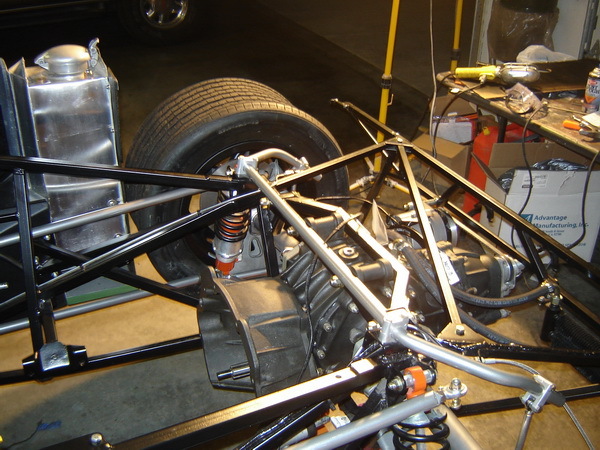 The second (from Dave's site) shows the suspension and rear chassis in 2008. Check out the images on Dave's site and I can't wait to see the car in its completed state. I must get back there to see it again once it's finished! Sad, but perhaps not that surprising, news from Top Gear Magazine's website. "Marcos is dead. Just five years after being revived from bankruptcy by Canadian businessman Tony Stelliga, it has this week been announced that the British sports car company has gone into administration. Stelliga has already started to wind down Marcos business operations, though he will retain ownership of the name. Diminishing sales and rising production costs were blamed as the major factors in Marcos' demise. "We could not attain a profit point, reduce our cost base or raise the necessary capital to sustain the business," said Stelliga. Founded in 1959 by Jem Marsh and Frank Costin - stick their surnames together and you'll come up with Marcos, see - the company fell into bankruptcy in 2000 before it was rescued by Stelliga. Despite development of the open-topped TSO, powered by a Corvette-sourced V8, lack of investment and low profit margins scuppered Stelliga's business plans. 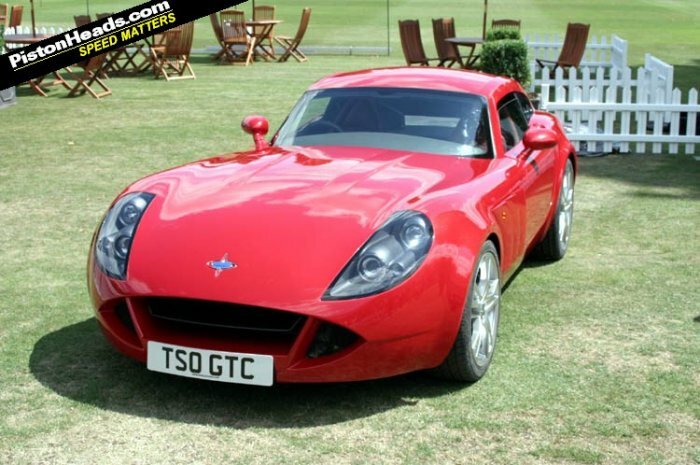 Marcos will fulfil existing orders of the TSO GT before its assets are sold off and factory closed." One has to wonder just how much work will be involved to 'fulfil existing orders'. 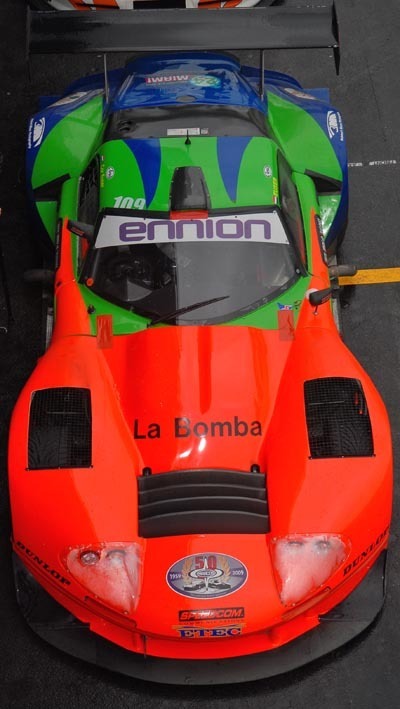 Gary Harman sent me this shot of LM95-002, one of the two cars run by the factory in the 1995 Le Mans 24 Hours, in a recent shake down test. 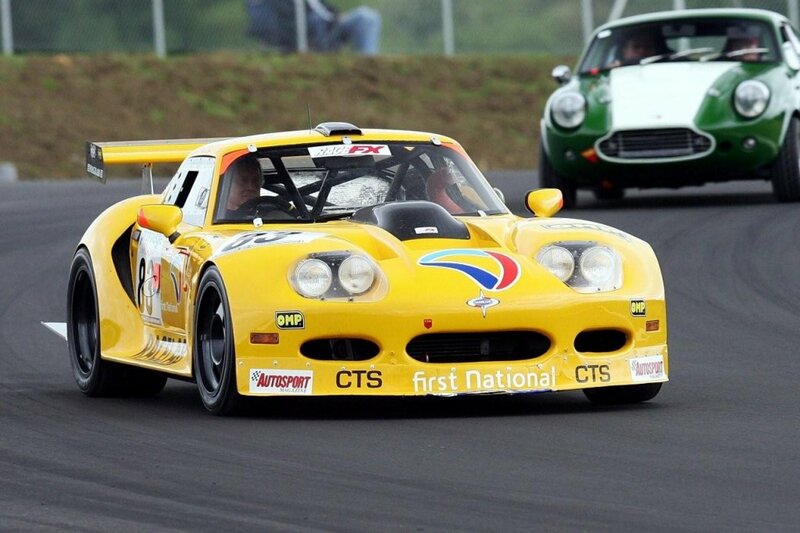 This car had been owned by Gerry Taylor for some years and campaigned in the British GT series, but it was sold last year and is now returned to its original livery, ready for FIA 1990s GT racing. 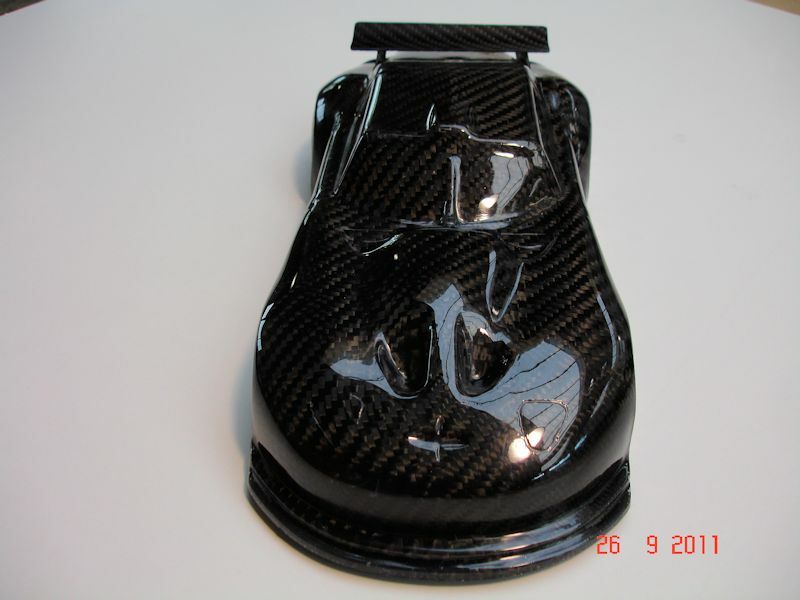 7th December 2006 : New 1/43rd scale model manufacturer launches with the Marcos Mantis! Robert Preece got in touch to let me know he's formed a 1/43rd scale model company (JaR Models) and their first model is the late 90s Mantis! An initial run of 50 Mantis Coupes will be the first batch, to be followed (date to be confirmed) by 100 Mantis convertibles - The numbers will ensure that demand will be high. They currently have a prototype for sale on eBay (shown above), but the Mantis coupe production run will cost £78 each (Bespoke 1/43rd scale models are never cheap and you're unlikely to ever find another Mantis model). 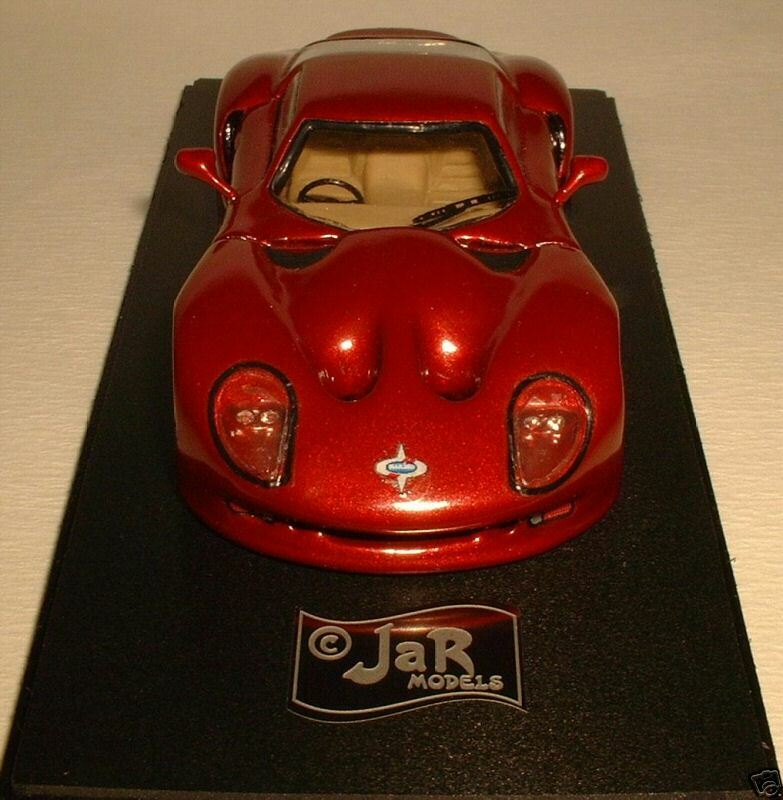 Contact JaR Models through their eBay account above or email Robert directly for more information. 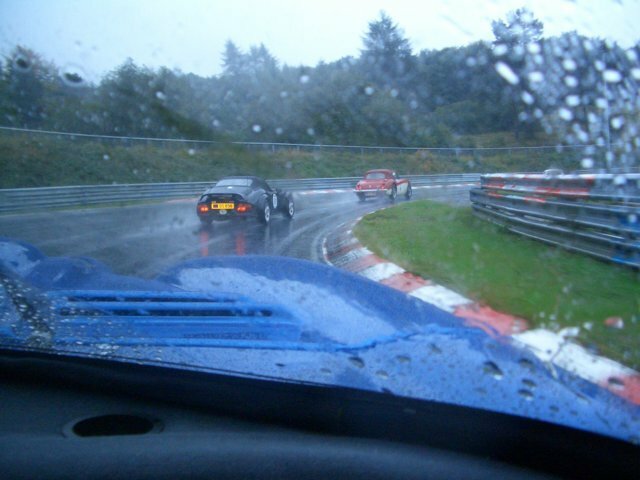 28th August 2006 : Still time to participate in the Euregio - Drive the Nordschleife! 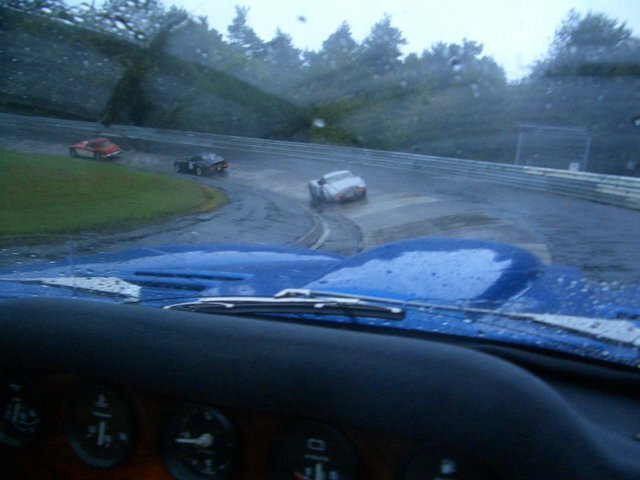 Christian Fey's been in contact again to remind me (and you) that there's still time to register for the Euregio and get a chance to drive your Marcos on the phenomenal Nurburgring Nordschleife circuit. Christian's mail reads : The reactions on the invitation to the Marcos Euregio Meeting were excellent and nearly everybody who joined us last year will come again, as well as some "new" Marcos owners. Till the 30.08.2006 you have to fill in the entry list. The entry list & regulations you will find here.. The entry list is bilingual and therefore I don't think you will have problems to complete it. You can send the dates via Fax or Mail to Mrs. Berthold ADAC. Please send me a copy or short mail, that you will come for a better organisation. If you want to have booked the Hotel, let me know if you want a "single / double room" and "smoker / non smoker room". Program: Friday you can book 2 trackday sessions from 2 hours for the "Nordschleife" and the "long GP circuit" for 75 Euros each. Booking and Payment directly on the ciruit. This is a very good oportunity to learn the circuit.Last year only 65 cars were on the track in both sessions. So you will drive completly alone and can really concentrate on the circuit. 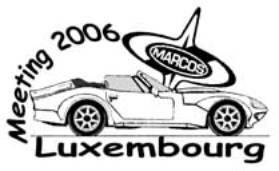 Marcos Factory perhaps will join the event with the new Marcos TSO Targa and for the evenig we have invited a person who will tell us a lot concerning the design work in the 60s and 70s if his health will allow him to fly. To get a impression what will you expect, follow this link for a video from 3 weeks ago with 2 other Marcos driving on the Nordschleife. Don't forget to fill in the entry form and to send to Mrs. Berthold ADAC and hope to see you soon. If you plan to attend, fill in the form NOW!!!!! A couple of days ago, Marcos unveiled production versions of the TSO. There is a targa topped version, as well as the coupe, which seems pretty much as seen before. suspension, racing brakes and a rear diffuser. The GTC is priced at £49,950. and is priced at £53,950. delivered this summer to the Marcos Dealer Network. British Supercar”, said Tony Stelliga, Marcos Engineering’s Managing Director. responsive, the TSO inspires confidence and is communicative up to and beyond the limit. further enhance the TSO’s drivability and performance. 70 mph time of just 2.1 seconds. Top speed is over 185 mph. Christian Fey emailed me to say the Luxembourg Rally photos are now online. 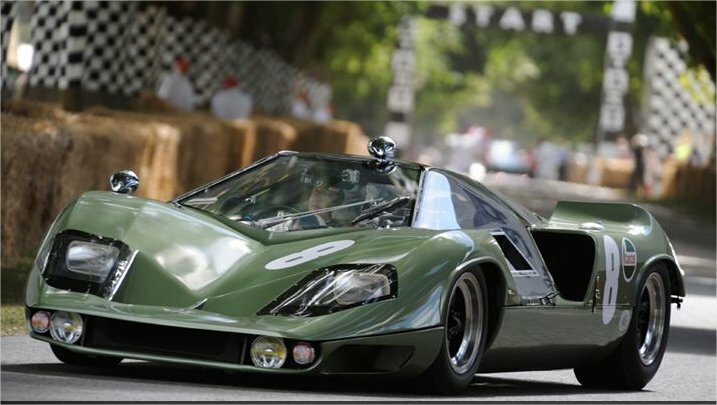 Click the image above to see the photos, click the image of the Marcos bonnet and then click the 'Spielen' button to see a slide show of the images. Just received this from Roger Garland. On Sunday 4th June we will be at Bristol Mini Day. The MMOC have arranged to have a club stand at this event, which will take place at North Somerset Showground, Wraxall, a few miles off the M5 just south of Bristol. However, this one will be a little different - as we aim to provide the customers with some plastic cars to help brighten up their day. This is where you come in! If you have a Mini based kit car (or a Mini) that you can bring along to help "populate" the MMOC stand, we would really appreciate your support. We have booked the space, but we need the cars / people. OK, you may have other things on or live miles away, but if you can make it, this is a chance for you to get out and about and to support the club. So where will you be the weekend after next? Melanie and I plan to be attending the Cheshire Kit Car + Classic Car Show, promoting the Mini Marcos Owners Club and generally having an enjoyable day. We have booked B+B on a nearby farm for the Saturday evening, so we should arrive at the showground in good time on the Sunday morning. How about joining us and help "wave the flag" for MMOC?? - If not for B+B (although that is also an option - details available) then at least for the show on the Sunday? Now in its 23rd year, the popular Cheshire Kit Car + Classic Car Show is organised by the Rochdale Owners Club and supported by "Which Kit?". Set in the beautiful grounds of Capesthorne Hall, Macclesfield, Cheshire, the annual gathering has gained a reputation as a friendly, fun day for car enthusiasts and their families. The Jacobean-style Capesthorne Hall, with its Georgian chapel, holds a fascinating collection of paintings, sculptures and furniture. The 100-acre park offers lakeside gardens, nature trail and woodland walks. This year they are hoping for an even wider range of kit (both old and new) and classic cars, as a good display broadens the interest for all concerned. There will also be trade and craft stands, a funfair and a range of events in the arena including: inter-club tug of war, working stationary engine display, children's fun fair and refreshment stalls. A small number of manufacturers are also expected to have vehicles on display. Prizes are awarded for Best Car of Show, Runner-up, Highly Commended, Visitors' Choice and Which Kit? Car of Show. Last year a Mini Marcos was one of the "Best of Show" prize winners! * This is the same as the usual entrance charge to the grounds throughout the year. It includes access to all the attractions mentioned above except the Hall. The Hall is open between 12:30 and 3:30pm and costs £1.50 to enter. Getting to Capesthorne: Capesthorne Hall is situated just south of the A537/A34 crossroads, west of Macclesfield. It is sign-posted and within easy reach of the M6 (J 18) the M60 (J 3) and the M56 (J 6). The day of our Marcos Meeting in Luxembourg (2nd to 5th June 2006) is coming closer. For more details have a look at our homepage www.roadster.lu. Therefore we invite all interested person (having not yet done a reservation) to return the booking form as soon as possible, latest by the 1st of May. Many thanks for your understandings and also many thanks for your interests in our meeting. 17th January 2006 : Historic Marcoses found in Europe. Christian Fey's a mine of information and let me know of a unique Marcos GT. 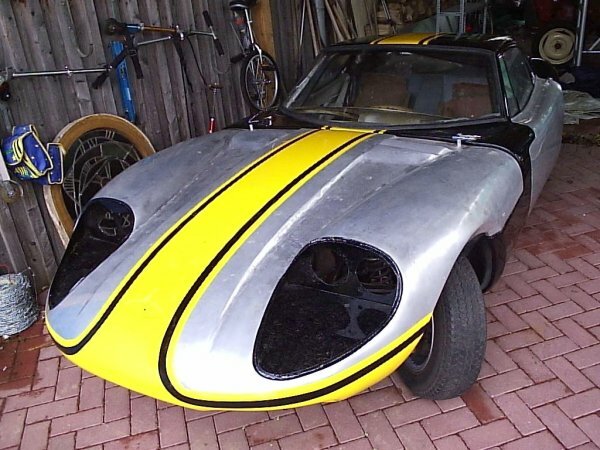 Perhaps a intersting information for you is, that we found the prototype of the Marcos GT in Germany after some years. I took some pictures of the car. It is the only GT with aluminum body. The car got a new chassis, parts of the body are new, engine and gearbox rebuild on a very high standard, but the car is not complete, no interior trim and some smaller things outside. The car is not complete, there are no more spares for this car, but I know where the original English number plates are with all the papers. The car was street legal. 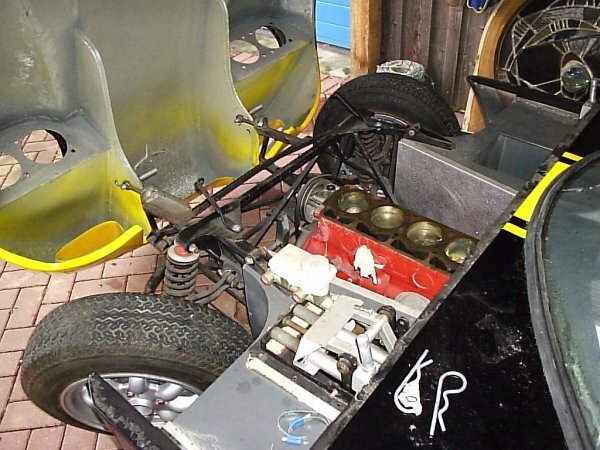 The last owner wanted to race the car, a FIA rollcage was fitted as well as race tank. The engine & gearbox are completly rebuilt. Chassis is new and a lot of the aluminum parts were completely renewed. The car is for sale for around 30,000 Euros - Original number plates and papers will come with the car. Here is an article from an English magazine refering to this car. 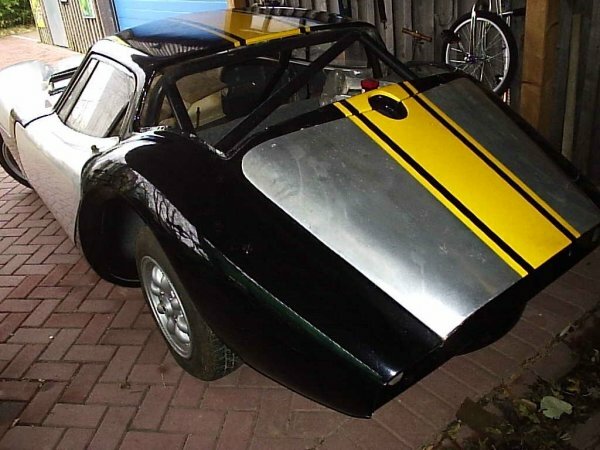 Tom will get in his workshop this winter the one and only Marcos Fastback Spyder. 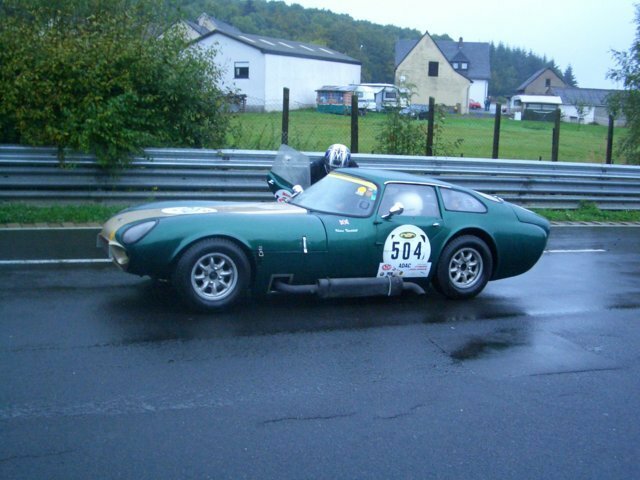 The car belongs to a Marcos owner in Belgium - Maarten Krikken - well known in the Mini Marcos club. The car is basically in very good condition and needs some work especially for the damaged bonnet. 17th January 2006 : More on the 2005 & 2006 Marcos Euregio at the Nurburgring. Christian Fey's been in touch to provide some more information and links about the 2005 Euregio and some great news for 2006. Thanks for mention the "Euregio Meeting" under the link "Events" you will find more and I think better pics. The link you have listed was from one of the co-drivers a "fist shot" immediately after the event and he was the first. Link: http://www.marcos-cc.de/eureg05web.htm. Other link from the Luxemburg Marcos website. In http://video.google.com/ with the search "Mantula" you will find 2 short video´s from my co-driver Twan Aldenzee - new Marcos GT owner from the Netherlands - the moment a Gulf Porsche overtaking us in my Mantula and later I was able to overtake the 917-10. 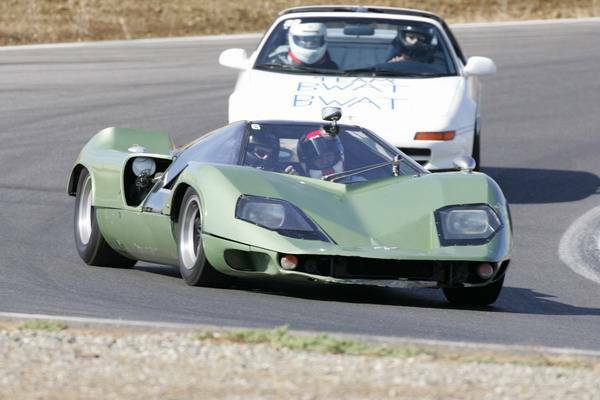 I think it was the first time that a Mantula did overtake a 917-10. Very exciting moment to drive with such cars on the "Ring". Over all every team driving on the Euregio got a DVD with Video´s from the event - in total nearly 2 hours Marcos driving on the Nürburgring - and a CD with nearly 1.000 pictures. All in all we did have a wonderful weekend with a lot of fun, and Klaus Tweddell did show us Saturday evening his selfmade film from the Spa 1968 race. For me the only known film showing the Mantis XP arriving on the truck to the paddock and in race. Very short but very impressive. The date for the Euregio / Classic 06 meeting will be this year the weekend 22.-24. September 2006 on the Nürburgring. Hope to see you with CLE 100H and a lot more Marcos owners with there cars. 1st January 2006 : 2005 Marcos Euregio at the Nurburgring. I feared I'd probably missed out on something amazing when I couldn't get to the Marcos Euregio at the Nurburgring and the images on the German Marcos Owners' Club website seem to bear this out. You can see all the photos at http://www.marcos-cc.de.vu/, but here are a couple of highlights! Michael Royson has written to tell me that the 1800 owners in Sweden have made new trailer arms from high tensile alloy (SIS 2342-05 heat threated), sand casted. 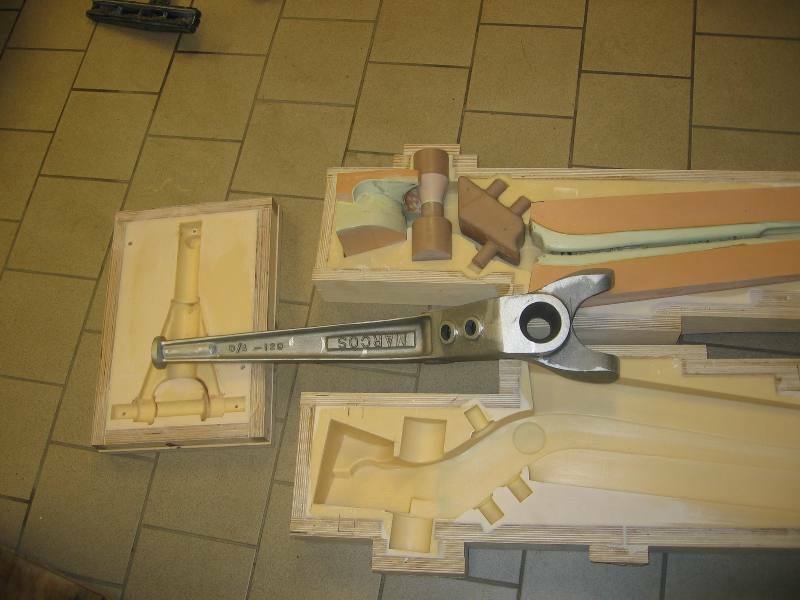 "As you can see it's one piece with both shock absorber brackets for LH and RH out of the mould. We will produce them machined and ready to fit. Please let us know if you're interested since this will be the one and only batch we will make! Price depending on the number produced!" 25th August 2005 : Marcos Euregio storms the 'Ring! Christian Fey has emailed me with news of the 2005 Euregio, the European Marcos event and it's a Corker! The "MARCOS Euregio meeting" will be this year in Germany in combination with the "Classic 2005" on the Nürburging first weekend in October. 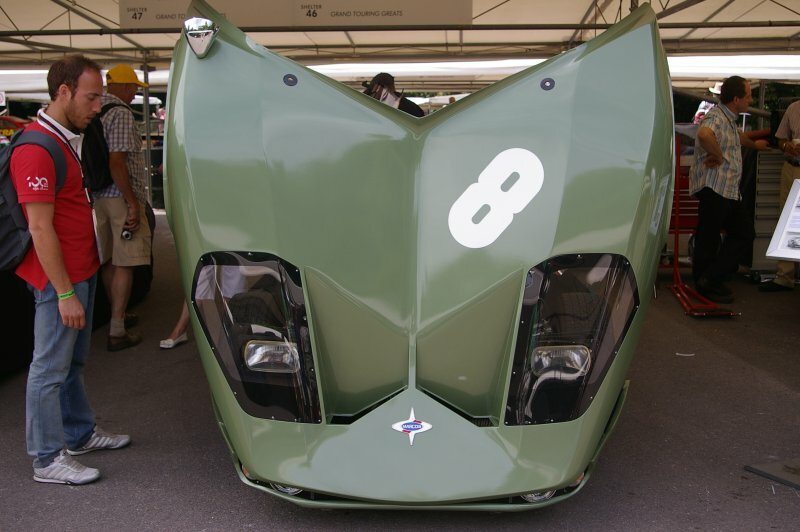 For the Marcos owners with Marcos cars we have a tent with special parking area within the paddock. Saturday we can drive with our Marcos and a Co-driver 4 laps on the old "Nordschleife" = 20 km and in the afternoon 4 laps on the Grand Prix track and the "Nordschleife" = 26 km. Both times it is a "Regularity Run". In the firts lap you will set your laptime - as quick as you want - and you have to repeat this laptime on the 2. lap and be 10 seconds quicker on the 3. lap and again in the 4. lap 10 seconds quicker than in your 3. lap. The overall winners as well as the best Marcos drivers will get trophys. So you can drive as quick as you want. Driver and Co-driver must wear a helmet. Sunday will be one hour demonstration laps on the Grand Prix track and probably - not yet confirmed - a third time 4 laps on the GP + Nordschleife. Everybody who will send a picture of his car with some details to the car will be pubilished in the race brochure and the brand MARCOS will get a complete page for the history. The deadline for the pictures is the 8.th September. The price for every team (1 car and 2 persons) including tickets to all races & practice sessions around the circuit = 25 km, free MARCOS laps on the track, free parking in the Paddock and a lot of events around the circuit is 150 € = for each team (car & driver & co-driver). For Friday the 30. September we will get the opportunity to drive as "installation & track day" on the "Nordschleife" from 8:15 to 18:00. You can buy a ticket for 1, 2 or 3 hours driving. Price not known yet and will follow asap. I expect around 30 € per hour. Saturday evening we will have diner together and perhaps some MARCOS pictures / film / video near to the ring. A Hotel is nearby for 49 € for the room and 6 € p.p. for continental breakfast. http://www.hotelnord.net The Marcos cars can be parked on a closed and guarded parking place. Unfortunately it is very short-dated, but this event will happen the first time on the Nürburgring and we got this afternoon the first informations and Maarten´s marriage and moving house does not allow him this year to arrange the Marcos Euregio Meeting. Hope a lot of MARCOS will come and profit from this unique possibility to get in contact and drive through the "green hell". PM me, if you will participate or you have further questions. Sadly my car's off the road (still...), but if you have a healthy Marcos can you really miss this opportunity? Roger Garland at the MMOC has emailed me with news of the Mini in the Park event. Mini in the Park is rapidly approaching. I have ordered a supply of tickets (at a considerable discount) and these should arrive within the next few days. Admission on the day will be £15 per person. 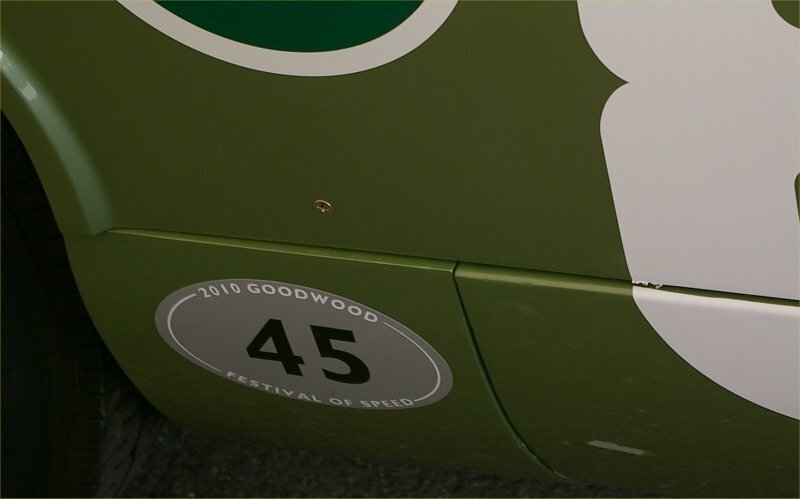 However, advance tickets for drivers of MMOC cars are now available at just £6 each. Passenger tickets are £10 each. As you may know, Mini in the Park is the world's largest Mini show - and we can be there! For 2005 the event returns to it's original venue, Cornbury Park, Near Charlbury, Oxfordshire. There will be over 100 trade / autojumble stands and more than 120 club areas!! Yes, it really is that big - all we need is fine weather, plus you. the MMOC at this event (and obtain cut-price admission!) please let me know at the earliest opportunity. 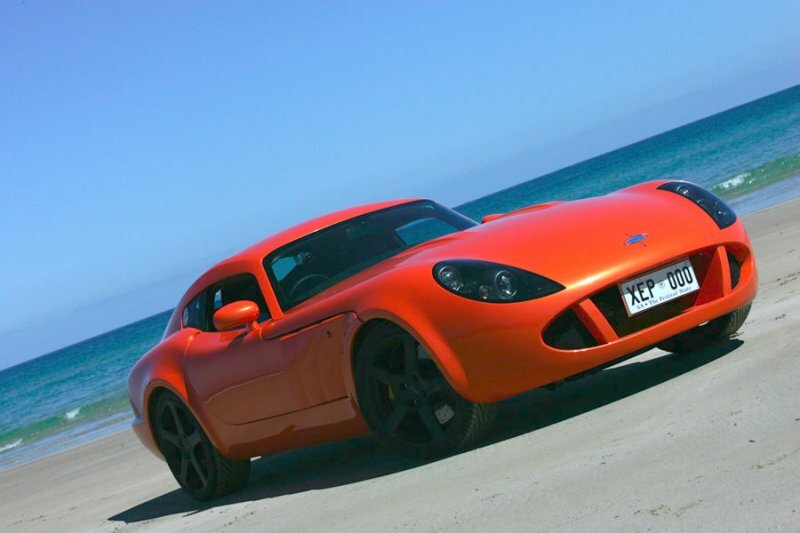 26th March 2005 : Marcos launch Coupe! Exciting news from Marcos (and yet another indication of a return to the circuits?) is that they have launched a Coupe version of the TSO. Unveiled in Australia (and, currently, designed to Australian specs, oddly), the TSO GT features the same technical spec as the TSO convertible, but in a rather Cobra Daytona style coupe form. To my eyes, even in that Orange (Is everyone at Marcos colour blind?) it looks a much better looking car than the TSO, with the front and back looking less at odds with each other. More info on the Marcos Engineering website. Full marks to Tony Stelliga and the team for taking the marque forward. 26th March 2005 : XP returns to the track! I spotted over on Dave McGill's website that Ned Morris had carried through his musings when we visited his family and the XP and taken it out onto the Thunderhills circuit. When the Mantis arrived on it's trailer, all heads turn in unison as the Mantis slowly rolled by. It was clear very few people had any idea what this car was. All day the Mantis attracted interested from puzzled sports car fans, most wanting to know, what was this outrageously styled (and loud) sports car? Roger Young has written to all MOC members to let them know of the upcoming AGM. The constitution requires an AGM to be held annually and the [13th March] has been designated for that meeting. The meeting is taking place at the Coventry Suite, Coventry Hilton Hotel, Paradise Way, Walsgrove Triangle, Coventry, CV2 2ST between 2:00 and 4:00 on the 13th March 2005. This is close to Jct 2 on the M6. If you are a member and wish to attend, email Roger as attendance is limited. Also, there's news of the MOC 2005 Rally. It will take the familiar 2 day format, with Saturday 2nd July at Curborough Sprint Track and Sunday 3rd July at Billing Aquadrome for the annual concourse. For more information on Saturday night accomodation and meal, contact Richard Partridge on 01206 860223. 22nd June 2004 : Latest info on Euregio. I received this recently from Maarten. Meeting on September, 11th and 12th. be a day out for the whole family! near vicinity of the museum. are only open one day a year, will be more than worthwhile. planned and Terry Sanger agreed to speak on saturday evening. As soon as more details are known, I will get in touch off course. Big, big news on the Marcos front. The following press release announces the 5.7 Litre Chevrolet powered, Marcos TSO (Omologato) and an alliance with Prodrive, most famous for being the team behind Subaru's rally programme and Ferrari's 550 GT racer. 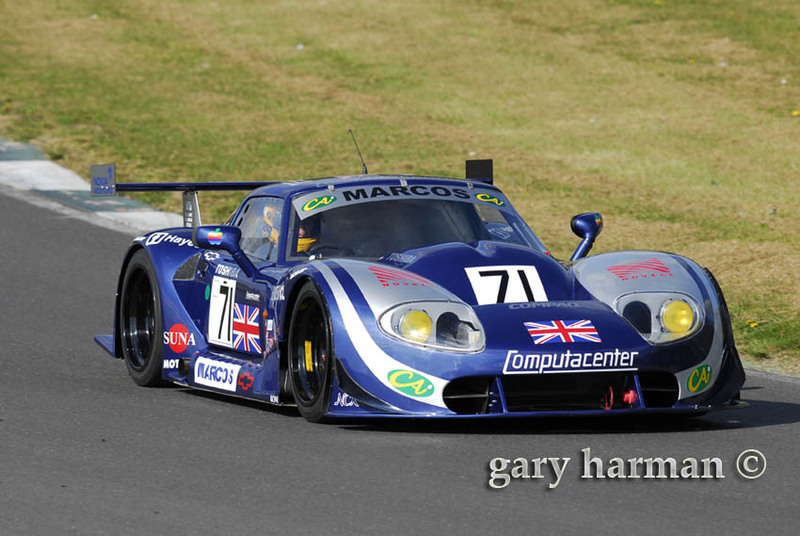 BIRMINGHAM, UK, 25th May, 2004 – Marcos Engineering Ltd ("Marcos") is pleased to announce the new Marcos TSO roadcar – making its debut at the Sunday Times Motorshow at the National Exhibition Centre In Birmingham. This two seat open top sports car delivers an unprecedented level of power, precision and style in the company’s 45-year sportscar history. From the outset, the new management and engineering team at Marcos set out to build a reliable, easily drivable two-seater, yet instill the TSO with many of the attributes found in Marcos racing cars. This has yielded a road car with exceptional performance and agility while also being comfortable in daily driving and at home in any environment. The resulting "TSO" or "Omologato" is derived from its racing blood line and as such delivers an awe inspiring 400 horsepower in a two seat roadcar that weighs just 1090kg. These impressive power to weight figures enable it to accelerate to 60 mph in just 4 seconds and to 100mph in just 9 seconds. Top speed is estimated to be over 185 mph. Power is provided by a 5.7 Litre V8 Engine derived from the same GM powerplant used in Marcos and Corvette racing cars worldwide. This Aluminium Alloy block and head design is extremely reliable and lightweight. The TSO R/T benefits from intake and valve train enhancements to increase useable horsepower without sacrificing drivability or fuel economy. The TSO provides driving agility and impressive road holding due to extensive chassis development and testing under a partnership with Prodrive – a recognised leader in chassis dynamics, vehicle dynamic systems and powertrains. Currently, Prodrive has six World Rally titles and five British Touring Car Championships to their name. The design team was driven to capture some lines from the 45-year winning history of the brand, yet take the design forward in precision, quality and style. Designed by Damian McTaggart, formerly the designer of TVR’s Cerbera, Tuscan and T350, the TSO’s lines are exceptionally clean yet aggressive. The design effort coupled classic sculpting techniques for real-time feedback with state of the art CAD techniques for precision and speed. The entry level TSO is priced at £39,950 and delivers 350HP with a 5-speed transmission and 17 inch wheels. The TSO R/T is priced at £44,950 and produces 400HP with a 6-speed transmission, sports suspension package and18 inch rear wheels. "The TSO marks the return of the sharp, affordable, high performance V8 British sports car ", said Tony Stelliga, Chairman of Marcos Engineering." We believe it hits a gap in the marketplace that stirs the soul of motoring enthusiasts and are thrilled with the result". Marcos Engineering is also pleased to announce it will be expanding operations into their own new 6,000 square foot facility at Prodrive’s Kenilworth site in Warwickshire. This facility provides a 1.5 mile high performance circuit and one of the few split low grip surfaces in the UK capable of simulating driving under slippery road conditions. 9th May 2004 : Marcos on eBay news. Marcos items seem to be selling for high prices on eBay. A few months ago a bonnet badge sold for around £250, list prices was £65, last I checked and I saw one for sale for less than that at the London Classic Car Show in April. 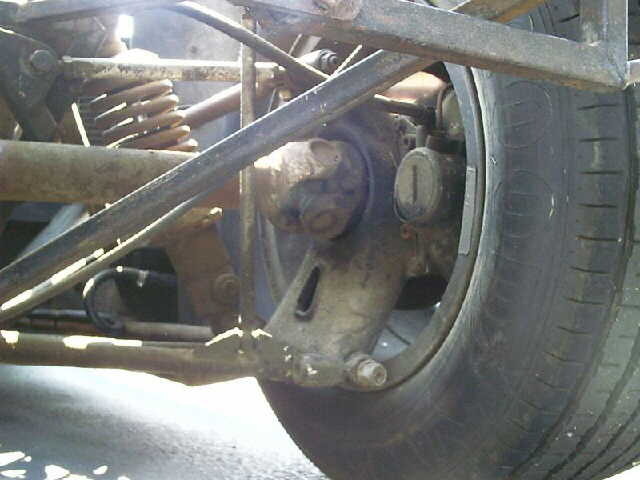 Just a couple of weeks ago, a set of unpainted Magnesium wheels (as fitted to the 69-72 V6s) sold for £195 (actually, that's not bad for 5 wheels...). And most amazing (perhaps) of all, a Fly LM600 slot car, customised to represent the TFM-GT car (and one of just 15 made, apparently) by 'Mantara' sold for £320. 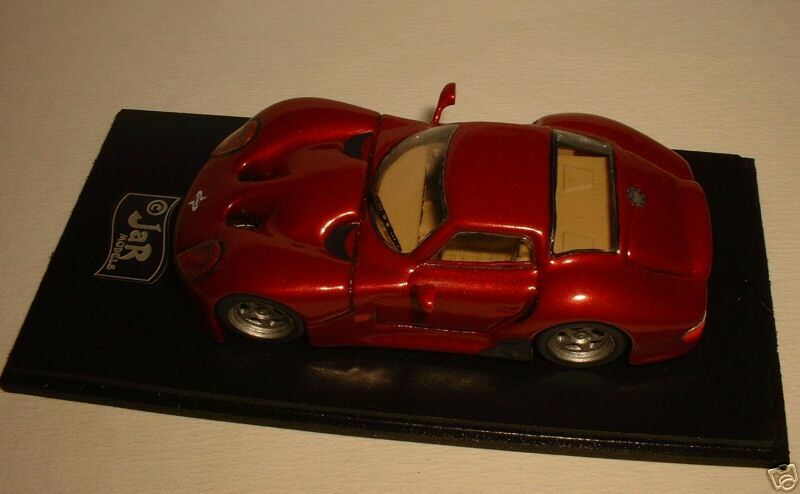 'Mantara' undertakes commisions, so if you fancy a unique Marcos slotcar (at more reasonable prices than the £320! ), drop him a mail at Willie895606@aol.com, mentioning the Marcos Website. 9th May 2004 : Marcos Scale Model news. Maarten Krikken sent me the following, regarding some interesting Marcos models which are available. There is some interesting news for the model car enthusiasts among us. couple of years will know the models very well. go and send them of to who-ever has ordered them. I any of you is interested in these models, I am happy to hear from you. 'The Quiffster' has sent me the following regarding the chance to join the pre-24 hour festivities at this year's Le Mans race. know of), and details can be found on the Forum under the 'Events' section. Received this today from Lary Killick of the Marcos Owners' Club. We are holding the MOC Rally early this year, 8th & 9th of May. The Saturday is as usual the Sprint at Curborough, and the Sunday is at Chatworth House. Although it is separate from the CMI meeting this year, it is not because of any differences, it is to give all members another event, by combining the two rallies we all lose an event, so members of either club all welcome to participate. Sounds good, especially if the two rallies are regionally dispersed, giving more people a chance to attend at least one of them. Received this a while ago from the Marcos Owners' Club - Hopefully things will be a little more active on this club's front. Any chance we'll FINALLY see the Workshop manuals??? 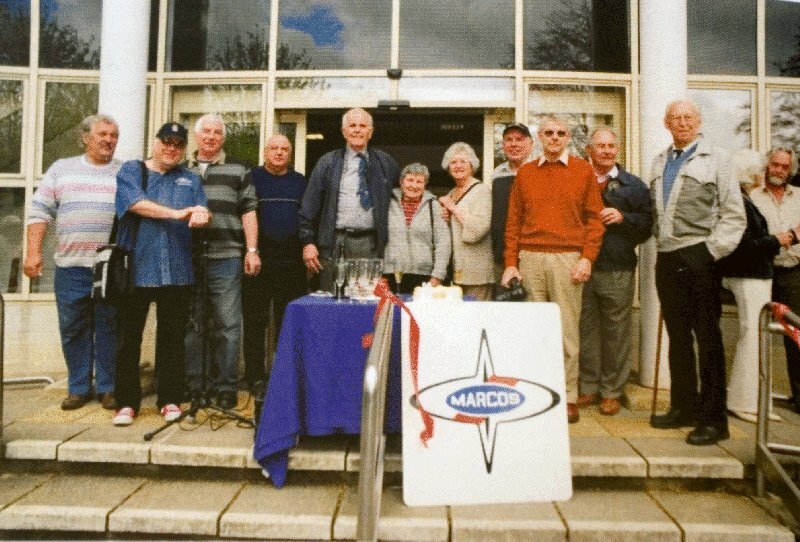 On Saturday 29th November 2003 “The Marcos Owners Club” held its AGM, it was the first one since 1996. The omission of previous AGM’s was due to various reasons, but now we have had one, and as a result we have created a new Committee. As an associated party to our Club it could be of interest to you to know who is now responsible for what part of the Club, so I am listing all the Committee Members below with the role each has agreed to fulfil to the best of their ability, hopefully this will meet the demands of the Membership and the Club can move forward. The Committee Chairman has yet to be elected, the magazine and website have yet to be debated as to how they will move forward with the Club. In the mean time any correspondence regarding the Magazine and website should be sent to the Secretary. Website & Forum; Oliver Hawkins. National Show Organiser; Richard Partridge. PR & Regalia; Paul Crocker. If you have a need to contact any of the above Committee Members please contact the Secretary (details at foot of page) for the relevant contact details. Would you please amend your records regarding The Marcos Owners Club details. I hope that our new Committee will give you as good a service as you would like in the future, if however you recognise any short comings please do not hesitate to bring them to our attention, we want the Club to become as good as it once was and hopefully will be again, to this end we will view any criticism constructively. from, The Marcos Owners Club Committee. A casual search revealed this recent interview (from a local BBC programme) with Jem, his wife, Isobel Chivers and a number of owners and factory staff. The actual film clip is, sadly, of poor quality, but it's an interesting, and rare, insight into what's going on at Marcos. August 22nd 2003: Lockie back in an LM600! Former BRDC GT champion (in a Marcos), Calum Lockie, is to team up with Cor Euser once more to contest the 1000km de Spa on August 30/31, in the Marcos Racing International Marcos Mantara LM600 Evo. have backing from Serco for the race. "It is fantastic! I've pulled out all the stops to put a deal together,"
Cor again in the Mantara, and secondly to be racing at Spa once more." finish as high up as possible. A class win would be fantastic," he says. lunchtime on Sunday 31 August. If there is any way you can get to Spa, I highly recommend it, it's like Brands Hatch is the Scalextric version of Spa! Good luck to Calum and Cor and it's great to see Calum back in a proper car after wasting time with those tuned FIATs! PS. I've just heard that the car is running in the the invitation class with 700bhp!!!!! - Melindi's (Calum's partner) exclamation marks - but perfectly justified!.